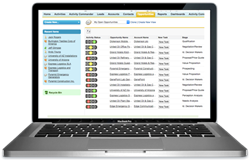 Stony Point, Inc. announced today the release of Activity Commander Winter ’16, version 1.22.0. Activity Commander continues to get better with every release. The new version of Activity Commander continues to allow customers to create custom, activity scoring systems and see visual indicators of the relationship health of their customers and prospects. In addition, Activity Commander Winter ’16 includes several enhancements, including improved ability to configure the activity scoring system, the ability to add configurable list views to the Salesforce home page and fields to better support the new Salesforce Lightning Experience. Activity Commander is an add-on application to Salesforce and is available for download on the Salesforce AppExchange (appexchange.salesforce.com). Founded in February 2011, Stony Point, a Salesforce consulting partner and Salesforce ISV partner, has rapidly become a leader in promoting Salesforce adoption. Stony Point offers productivity applications, consulting, training and recruiting services throughout the world with a focus on helping clients recognize a high rate of return on their investment in Salesforce. To learn more about Stony Point and the products and services offered, please visit http://www.stonyp.com.